About five years ago when I blogged an explanation of Paul McCartney's phrase "Mother Mary comes to me", reader Binho suggested that I write about Don McLean's "American Pie," and offered a link to an extensive analysis of those lyrics. 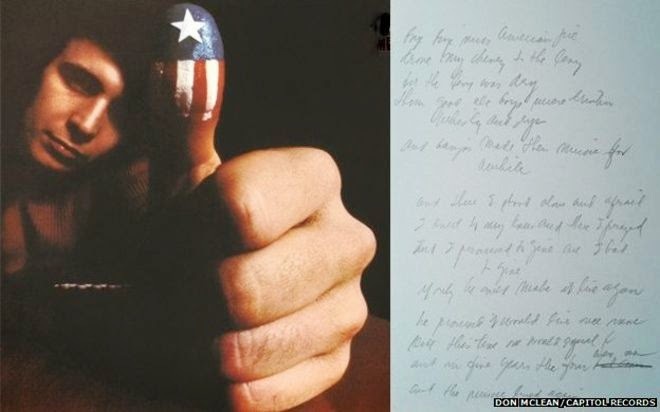 This past week McLean's notes from his writing of the lyrics were sold at auction, and the BBC used the occasion to revisit questions about the lyrics. "Who broke the church bells? Who was the jester who sang for the king and queen? And what really was revealed "the day the music died"?" I work in radio and one of our DJs interviewed Don McLean shortly after American Pie came out, he asked what the lyrics really meant, Don's reply was "they mean I'll never have to work again"
I'm glad you're still around. You are now officially one of the "old-timers" here.